Richard Ungar is the author and illustrator of the new children's picture book Yitzi and the Giant Menorah. 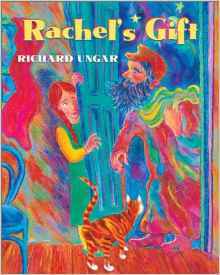 His other books for kids include Rachel's Gift and Time Snatchers. He is a lawyer, a painter, and a writer, and he lives in Toronto. Q: How did you come up with the idea for Yitzi and the Giant Menorah? A: I always wanted to write a story that took place during Hanukkah (I had already covered some of the other Jewish holidays… Rosh Hashanah with Even Higher and Passover with Rachel’s Gift). My best recollection of how I came up with the idea (it was actually quite a few years ago that I wrote the story and it sat on my computer for a long time while I was busy with other projects) was that I was surfing the internet and came across some images of giant menorahs. Then I asked myself the obvious question (well, obvious to me at least) … how would the silly people of Chelm react if they were given the gift of a giant menorah? The story practically wrote itself after that! Q: When you’re working on a picture book, what comes first, the writing or the illustrations, or do you go back and forth between them? A: For me, the writing always comes first. I need to have the story work as a story before I tackle the illustrations. In fact, when I submit a picture book idea to my publisher for consideration, I always submit the entire story by itself without any pictures. It’s only after they agree to publish the story do I begin thinking about the pictures. For Yitzi and the Giant Menorah the only twist was that I wanted to use a new illustration technique (watercolour monoprint – which involves painting on glass and then transferring the image to watercolour paper)… so before I began working on the illustrations I submitted a couple of samples of what they might look like using this technique. But I still sent my editor the story first. There is some editing that goes on with a picture book text so I deal with that at the same time that I am working on the illustrations. 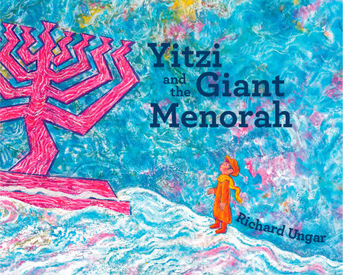 But most of my time is spent on the art – doing the rough drawings and then the final illustrations, which in the case of Yitzi and the Giant Menorah, was a two-year project. Q: You’ve written for different age groups. Do you have a particular preference? A: Wow, that’s a tough question! I enjoy writing for the people who read my picture books which I expect are mostly younger children and their parents. But I also really like writing middle grade fiction, where the target audience is probably 9 to 12 years old. 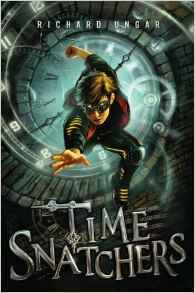 I wrote the Time Snatchers series for that age group and the time I spent writing those novels was so much fun. I really mourned the loss of my main characters - who I got to know really well - after the series ended. Q: Why are stories about Chelm still told and retold today? A: There is something about the Chelm stories that make them timeless. I fell in love with these stories when I was a child. I believe it is a combination of things - the villagers are very silly and do things that can be quite amusing but at the same time in their own way they are excellent problem solvers and always seem to triumph in the end. 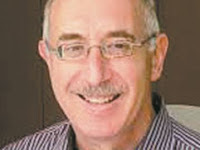 And often the whole village gets into the act trying to solve a problem – so the community aspect of that I believe appeals to a lot of people. The Chelmites are never mean-spirited and their determination is impressive! A: I seem to be bursting with ideas these days. I have a couple of picture book manuscripts on the go… these are a bit of a departure for me because neither of them take place in Chelm! I have also begun writing a middle grade fantasy novel involving alternate worlds and what might be a chapter book set in the Bronx during the 1940s. A: I went a little crazy building props for my presentations of Yitzi and the Giant Menorah. I built a giant pink menorah out of foam board that is over 7 feet tall and 9 feet wide… I had to rent a truck to take it to a school reading! The other fun thing I did was, in partnership with PJ Library, I created a video series on how I created the art for the book which is posted on the PJ Library website blog and also on my own website blog.